Does the brute force method work? In other words, if you’re preparing for a test, should you memorize the answers to all the possible questions that might come up? And if you’ve read about investment banking interviews, many people recommend this strategy for interview preparation as well. They present hundreds or thousands of questions and answers and suggest that you move down the list and check off each question. But is that the best way to prepare? No, not by a longshot. Rather than memorizing 77,123 questions and answers, you should use the Rule of 3 to prepare quickly and efficiently. Investment Banking Interviews: What Do You Need? Requirement #1: Your Story (150-word outline and 200-300-word full version). Requirement #2: Answers to common “Fit” Questions (Strengths/weaknesses, leadership, etc.). Requirement #3: Deal Knowledge – the bank’s deals, a deal you’ve researched, and your own deals (if applicable). Requirement #4: Mastery of the technical side, especially accounting, valuation, and DCF analysis. The last one will take the most time: You can certainly review technical questions quickly, but you cannot “learn” or “master” them in a few days before your interview. But there are efficient ways to prepare for everything else on this list. Previous articles have covered Your Story, Deal Experience, and valuation-related topics, so I’ll focus on “Fit” Questions here. 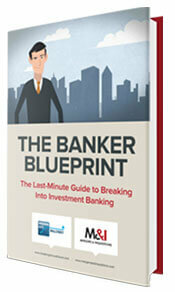 Investment Banking Fit Questions: What Are They? Investment banking fit questions, also known as investment banking behavioral questions, are any questions that do not fall into one of the other categories above. Why do you want to work at our bank? Some people argue that they’re more important than technical questions because technical questions weed out candidates, but qualitative questions determine who gets an offer. Others argue that they’re not that important because bankers have begun to focus on technical skills and work experience. Some people argue that you can’t prepare for these questions because many of them concern your hobbies, interests, and activities. Others say that it’s critical to prepare for these questions because senior bankers ask a lot of them, and senior bankers have the most decision-making power. First, Your Story should already answer many common investment banking fit questions if you’ve prepared it properly (e.g., Why our bank and group? Why investment banking? Why are you changing careers?). You should prepare for the other qualitative questions that Your Story doesn’t answer, such as your strengths and weaknesses. Everything else will be a “common sense” question (“Are you just applying to investment banking roles?”) or a question about your understanding of the industry. In many cases, bankers use behavioral questions to probe for your real weaknesses. Banks are risk-averse, and they’d prefer to hire someone who’s competent in many areas with no major flaws than a superstar who also has a serious problem. So, the entire interview process is more about weeding people out than finding the best candidates. Prepare 3 “Short Stories” from your academic and work experience that demonstrate the qualities bankers are seeking – analytical skills, attention to detail, teamwork/leadership, knowledge of deals, client management, etc. You can re-use these stories to answer most qualitative questions. Select 3 Strengths and 3 Weaknesses. The strengths should be easy because you already know the qualities that bankers are seeking (see above); the weaknesses are more challenging. Address Your Top 3 “Real” Weaknesses. For example, do you have a low GPA or, in the U.K., low A-Levels? Do you not have relevant work experience? Are you a job-hopper? Do you know accounting/finance? Are you boring? While your main Story is important, it also tends to be long – and bankers have ADD. One “Success” Story – You had a difficult task or challenging goal, you fought against the odds, and you won. One “Failure” Story – The same as above, but you did not succeed. However, you learned something valuable or changed as a result. One “Leadership” Story – If your other stories were about you as an individual, this last one should be about how you worked in a team or how you led a team. This one should, ideally, be a success story. You can generate these stories from your activities, class projects, and work experience, but you should use mostly work experience if you’ve been working full-time for several years. 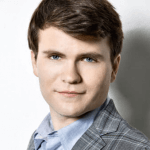 One “Success” Story – You did a corporate finance internship at IBM where you analyzed thousands of transactions, streamlined the five most time-consuming processes, and saved thousands of work-hours. One “Failure” Story – You started a math tutoring business in university, had some initial success, but couldn’t scale it properly, and had to shut it down; you learned the need to separate roles and delegate more effectively. One “Leadership” Story – You did a Treasury internship at a biotech company; you coordinated with departments to move Cash around so the company could meet a Debt covenant, helping it avoid penalty fees. Aim for 30 seconds (~75 words) in your initial description of each story. If you go on for longer than that, “ADD/smartphone addiction” will set in, and the interviewer may get bored or cut you off. You need to think about your strengths and weaknesses separately because you won’t necessarily mention them in Your Story. Your Strengths should be easy: Pick qualities that bankers are looking for (see above), and make sure you can demonstrate them in your 3 short stories. For the “Success Story” above, you could point to your attention to detail, teamwork/leadership skills, and knowledge of accounting and finance. Stick to the common, boring strengths – don’t try to be “creative” by saying that you are great at basket weaving or scuba diving or something else that is irrelevant. Your weaknesses are much harder. In over a decade of conducting mock interviews, I’ve never heard a decent initial answer for this question. First off, do NOT go by our previous article on this topic because my thinking has changed, and I need to rewrite that article. There are no good answers to this question, but there are some terrible answers that you must avoid. Be Real, But Not TOO Real – Pick something that is a real weakness, but which is not a “deal-breaker weakness.” For example, you could say that you sometimes take too long to make decisions, which makes projects take more time. This weakness could affect your performance, but it won’t kill you. On the other hand, being bad at math or not being able to work long hours will kill you. Not Be Inappropriate or Overly Personal – Don’t talk about your health problems, family issues, religion, politics, etc. Be Something That You Could Potentially Fix or Improve – So, don’t talk about your height, the fact that English is not your first language, or your non-target school. “Sometimes I don’t speak up even when someone else on the team or a superior has made a mistake or overlooked something.” – This one is good because it’s not a universal weakness; it depends on the context. Sometimes, you should not speak up (e.g., if it will embarrass a senior banker in front of a client). “I don’t always manage my time well, and sometimes I focus more on finishing urgent tasks than making long-term plans.” – This one is less of a cliché than the “I work too hard” or “I’m too much of a perfectionist” response. “I sometimes take too much time to make decisions, or I second-guess myself, which makes projects take more time.” – This one could hurt you on the job, but it’s still better to deliver a correct work product, even if it takes more time. There are no “good” answers, but these examples are less terrible than others I’ve heard over the years. Many sources also recommend that you explain how you’re working to fix your weaknesses. That’s a nice idea, but you may not have enough time to explain it, especially if the interviewer has asked you for 3 weaknesses. Also, it will sound a bit artificial if you say that you’re using Approaches X, Y, and Z to fix Weaknesses A, B, and C.
So, if you do want to add this point to your answer, make it short and casual. The “weaknesses” above are not real weaknesses. Bankers will probe for your real weaknesses with more direct questions about your academic and work experience. Education: Attended a top private high school and then Princeton, Harvard, or Oxbridge; earned perfect grades and test scores, has significant accounting/finance coursework, and speaks at least 2-3 languages. Work Experience: Became interested in finance very early, and completed a corporate finance internship, boutique IB internship, and then a bulge-bracket or elite-boutique internship. Hobbies/Interests: Studied abroad in an exotic location, plays team sports, and has won international recognition for an activity. Demeanor: Sociable, charismatic, and makes friends easily. Then, use the “Track Changes” feature in real life to find differences in your profile – those differences are your real weaknesses, and you’ll have to address them when you answer investment banking fit questions. Education: Low grades/test scores? Non-target university? Don’t know other European languages if you’re applying to roles in London? Work Experience: No prior IB experience? No internships? Too old? Can you work long hours? Do you know accounting/finance? Hobbies/Interests: Are you boring? No sports? No real hobbies? Can you pass the “airport test”? Other: Do you speak English (or local language, if applicable) well enough to work here? Do you know the culture? Will you take a pay cut? Do you have a work experience gap? Engineers might receive investment banking behavioral questions on their ability to interact with humans, while lawyers may get a flurry of technical questions. Find your top 3 “real” weaknesses and come up with responses to them in advance. For example, let’s say that your top weaknesses are that you went to a non-target university, you don’t have much accounting/finance coursework, and you’ve graduated but haven’t completed previous IB internships. Non-Target University – If you’re in the U.S., say that you couldn’t afford to attend a top school, so you accepted generous financial aid at a lesser-known school. In countries with less insane tuition, point to a specific program at your university that you wanted to take advantage of, and say that you didn’t realize the importance of a top university because you had not yet decided on a specific career path. Lack of Accounting/Finance Knowledge – Point to self-study, the CFA, and any other certifications you’re working toward, and offer to prove your skills with a case study or other modeling test (NOTE: You must be very confident of your skills to make that offer…). Late Start to Finance – Say that became interested in finance at a late stage since hardly anyone at your university went into the field. But once your interest developed, it has been “your plan all along” to move into the industry, and you’ve been moving closer through a series of internships and full-time roles (e.g., audit/accounting to corporate finance to independent valuation firm). You’ll never be able to come up with perfect answers to these questions, but you need to have some answers to avoid being weeded out. Investment Banking Fit Questions: Brute Force… or Brute Elegance? The nice thing about investment banking fit questions is that you don’t need to spend days, weeks, or months preparing for them. You could easily spend a few hours, or even 30-60 minutes, preparing for these questions and still get good results. 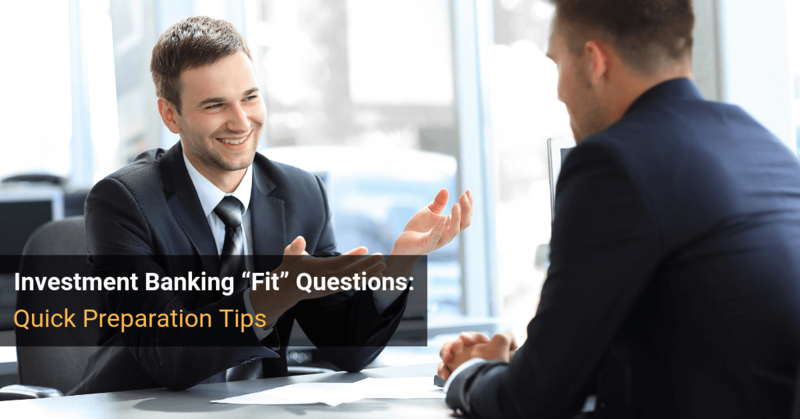 You’ll be able to answer almost any qualitative question, and you’ll know the key objections from interviewers before you walk into the room. And as a bonus, you won’t have to memorize 77,123 questions and answers – just your 3 short stories, 3 strengths and 3 weaknesses, and 3 real weaknesses. Thanks for the great help. I do have on question though: Can you use a story which is basically in short on your resume? Or do you need to use a different story that is completely new? You don’t need something completely new. Most bankers don’t even read your resume closely before interviewing you, so you won’t be repeating much. Hello Brian thank you for the material it qas good to learn from it. I had a question, lately there has been ethical questions asked such as “if your friend stole an exam and gave it out to your classmates what would you do?” Or “your friend is cheating/stealing would you tell professor?” Sort of questions how would you go about answering those? Ethical questions are easy because the correct answer is that you always do the ethically correct thing – so if your friend steals an exam and distributes it, you tell the professor, anonymously if possible so that you preserve the friendship while also making sure grades are legitimate. If they don’t believe you, give an example of when you did something like that in the past. You’re the best thank you! hey Brian, thanks for the article, enjoyed reading all of your posts, when you are planning to rewrite your post for weakness question? “Eventually.” We’re planning to delete 80% of the content on this site and reduce the interview content to 5-10 articles. So it will be a part of that process, maybe sometime in the next year. The Interview Guide already has better examples for the weakness question. Was wondering what you thought about the commonly used ‘Tell us something that is not on your resume’ question. Is it best to see this as a motivation question, or a chance to highlight a strength, or something different? It’s a chance to tell them your Interesting Fact, such as a study abroad experience, an unusual hobby or interest, an unusual family background, or something else like that. Mentioning a strength or something related to finance would sound artificial. Would you say ” I sometimes tend to get too fixed in details and lose sight of the big picture” as a weakness that’s acceptable? It could work, but it’s not a great weakness (partially because too many people use it, so it has become a bit cliche). Ooh, this is smart. Much better than trying to memorize 10000 questions on glassdoor, haha.